Light therapy uses exposure to bright white artificial light to help treat symptoms of seasonal affective disorder (SAD). This therapy may also benefit people living with bipolar disorder who are suffering from depression, suggest new findings published in the American Journal of Psychiatry, reports NPR. Researchers cautioned that patients should not try light therapy on their own, however, because the treatment can trigger hypomania, a less severe form of mania that can ultimately evolve into this period of extremely elevated mood and high energy. Sit observed that while these findings offer promising results for treating bipolar depression, it’s key that future research duplicate her findings and also show how light affects the body’s circadian rhythms (physical, mental and behavioral changes that follow a daily cycle), such as sleeping at night and being awake during the day, and how that affects bipolar symptoms. 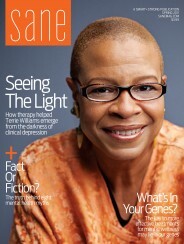 Click here to learn how amber-tinted glasses that block blue light may help treat bipolar disorder.